Well established NY State U-Pick Apple Orchard farm located in the famous Finger Lakes region near the progressive city of Auburn; short drive to Syracuse, NY. Hilltop setting with restored loft barn and century old farmhouse makes this farm a well known local destination. Orchard has 16 varieties of apples such as Cortlands, Macintosh, Empire, Jona Gold, Red Delicious, Macoun, Northern Spies, Crispin, & Yellow Delicious all laid out in wide easy to pick rows. 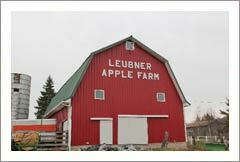 The farm is a well known destination during the late summer and fall apple harvest seasons. Owners also grow pumpkins, goards, Indian Corn, & Squash for "U-Pick" participants. Well appointed Apple House has a farm kitchen for pie baking, apple crisps, hot dogs, ice cream, cookies, popcorn & cider. This part of the business could easily be expanded. Very well restored Circa 1840's Early American 4 bedroom farmhouse boasts 1,700 + SF of comfortable living area. Master bedroom has a gas burning fireplace. Oversize upstairs bathroom has walk in double shower, jacuzzi tub w/ TV; big double bedroom with built in desk & storage. Impressive hard wood floors, all with radient heat. Basement is clean & dry. Two well water system runs through specialized reverse osmosis micron filtratation system that eliminates use of chlorine. Full line of very well maintained farm equipment customized for orchard & vegetable production. Farm is located in protected agricultural district with ag-exemption in place. Very good 25 acre woodlot with native hardwoods such as hard maple, ash, beech & cherry recently valued at $40,000. Maple syrup making could easily be an added enterprise. Business enjoys a good loyal customer base that returns year after year for apple picking, pumpkin harvesting, haunted hayrides, apple store products and other fall harvest season activities. Placement of a greenhouse would allow for year round flower and fruit growing. Plenty of flat tillable fields are ideal for strawberries, respberries and garden vegetables. This fine agri-business opportunity is bound to excited the alert investor seeking a good opportunity with plenty of upside potential. Financing options available to credit worthy Buyer. Call Tom Mullen for confidential discussion. Copyright © 2010 OrchardSmart.com All Rights Reserved.